When the environment has less moisture than usual, drought can threaten water supply, devastate crops, dry out forests, and reduce food and water available for wildlife and livestock. A corn crop in Arkansas is stunted and sparse due to drought conditions. 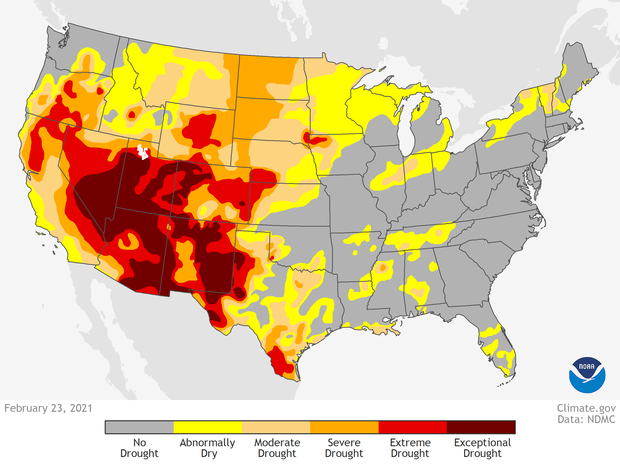 Most regions of the United States experience drought at least occasionally. Starting with below-average precipitation or higher-than-normal temperatures, drought conditions can sap moisture from the air, soil, plants, streams, and lakes within a matter of weeks. Depending upon how severe the conditions get and how long they last, drought can devastate crops, dry out forests, reduce food and water available for wildlife and livestock, restrict recreational activities, and stress businesses and economies. Higher surface temperatures brought about by global warming increase the potential for drought. Evaporation and the rate at which plants lose moisture through their leaves both increase with temperature. Unless higher evapotranspiration rates are matched by increases in precipitation, environments will tend to dry, promoting drought conditions. Current drought map. For additional information, see Drought.gov. Each week, drought experts assess the drought status of regions across the contiguous United States, and publish an updated version of the U.S. Drought Monitor. The experts consider how recent precipitation totals compare to their long-term averages. They also check temperatures, moisture levels in soils, and water levels in streams and lakes. Additionally, they watch for indicators of drought such as vegetation stress. Altogether, the experts check dozens of indicators to establish consensus on a range of drought categories. Before the weekly map is published, up to 350 people across the country review the draft to check it against reality. Each final map represents experts' best judgments of regional-scale drought conditions, validated by partners in the field. An Oklahoma rancher feeds supplemental pellets to cattle during drought. As demonstrated by the Great Plains drought of 2011, once drought conditions develop they can worsen rapidly, putting local resources and regional economies at risk. In general, farmers, ranchers, and business owners who monitor drought information and have plans in place for dealing with dry conditions before they occur will have more options for managing their risk. You can explore the 2010–2015 Texas drought in a story map created by staff of the Modeling, Analysis, Predictions, and Projections Program in the NOAA Climate Program Office. Story maps are web applications that combine maps, images, multimedia content, and narrative text. Open the story map "Evolution of the 2010–2015 Texas Drought" in a new tab/window. Excerpted and adapted from the report Climate Change Impacts in the United States: The Third National Climate Assessment (Chapter 2: Our Changing Climate and Chapter 3: Water Resources).